OST Converter-Perfect Software Program to Access Damaged OST File! Exchange OST file is usually inaccessible when the Exchange account is deleted. But the file still comprises all the email data intact inside the file. But how will you access this data when the file has become inaccessible? Many users confront such situations where OST data is crucial but due to corruption or broken file integrity users are cannot access data in it. Best OST converter has been built for such users so that the OST file is converted to an accessible file format and user is capable to use the data. OST Converter not only works as conversion tool but also recovers data from a damaged .ost file and thus serves dual purposes. An immediate need for OST Converter software is understandable once Microsoft Exchange Server gets serious setback because of corruption. Such situations can make you perturbed and you look for quick action because the repercussions of corruption in Exchange Server bring a halt to business. Export OST by default provides “Quick” scanning which works well with minor corruption, but if your OST is highly corrupt then you must go for Advance scanning. This can be done by simply checking the Advance Scan option while adding the .ost. Permanently deleted data items including emails, tasks, contacts, calendars, etc. from file can be recovered with this software. The OST Converter recovere data will posses all the original Meta data without any changes. 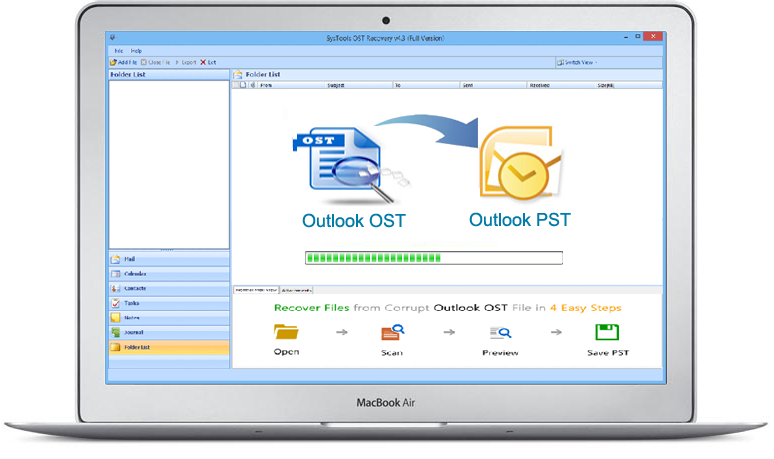 By using OST Converter Software you can change ost to pst or change ost into various MS Outlook data file format. This includes EML, PST, and MSG file formats. This software allows you to access the files in various email clients such as MS Outlook, Outlook Express, Entourage, etc. You have to select the file type in Export Options. OST Converter allows you to export selective file or folder. Once the OST is loaded, it will show complete preview and you can select the desired file or folder which you want to export by checking them. Once you are done with selecting this data, you can hit Export button. To filter out emails belonging to certain time period, you can provide email filter range. For this you have check the Mail Filter option and provide dates in From & To option. And the emails between this provided range will only get exported to desired file format. For OST to PST conversion an advance option of Split PST will also be provided which splits the resultant PST file according to size in GB provided by you. For OST to EML/MSG conversion naming conventions are provided for saving the emails in different ways of naming. If the above mentioned process does not work in your case, then probably your present email profile is somewhat incorrect, and so you will have to first delete it and then create a fresh profile or else you can straight away use OST Recovery software to deal with any kind of such issues, as our software is adept in solving all sorts of corruption issues with any degree of corruptness in your OST file.You will find this tool as the best OST converter, and a great aspect of getting associated with us is that you get a free trial through the demo version of the tool. In order to make the software execution with more reliability and confidently it is essential to run the software and practically test it. To know software better, you can test it by downloading the demo version of export OST file for free. Once you get to know all the features and working procedure, you can purchase the full version of OST Recovery at reasonable prices.